I've already talked about Adams in my previous review, but it's hard to get a sense of what makes him so special without reading him. So here's a few samples:"At our best and most fortunate we make pictures because of what stands in front of the camera, to honor what is greater and more interesting than we are. We never accomplish this perfectly, though in return we are given something perfect--a sense of inclusion. Our subject thus redefines us, and is part of the biography by which we want to be known. ""Art does not deny that evil is real, but it places evil in a context that implies an affirmation; the structure of the picture, which is a metaphor for the structure of the Creation, suggests that evil is not final. ""There will come a time when we stop naming places for lake shores that aren't there, and attaching to names eastern suffixes like 'glen' and 'green'. And if we call them by names that are accurate, we may ultimately find it easier to live in them. ""Finally, there is the joy to be found in a landscape experienced with family and friends. There are days that become, in the urgent and hushed sharing of a wonderful place with someone else, as much as I expect to know of the world for which I dream. To hear one's name, and the invitation, spoken with the assurance you will together see the same gift--'Look'. "And, from Beauty in Photography:"Our discouragement in the presence of beauty results, surely, from the way we have damaged the country, from what appears to be our inability now to stop, and from the fact that few of us can any longer hope to own a piece of undisturbed land. Which is to say that what bothers us about primordial beauty is that it is no longer characteristic. ""If, as a personal matter, I have chosen not to make color pictures, it is because I have remembered how hard it is to write good free verse, with which color photography has some similarities, both being close to what occurs naturally. "Well, enough said--or rather, quoted. 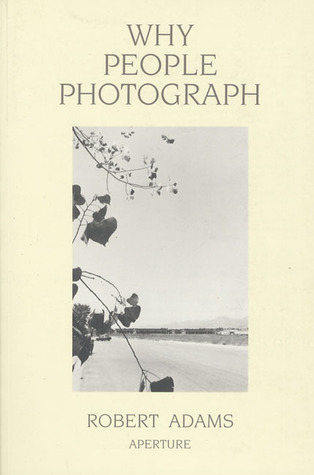 A collection of essays on photography, some of which are slightly related, others of which are not. There are some interesting insights and inspirations in some of the essays, but as a whole, I found the collection to be lacking. I had hoped to gain a better perspective on why people photograph and what makes for a classic artistic photograph, what makes photography in and of itself a great artistic medium, but didn't really find that here. THis collection of essays was not exactly what I was expecting. The title is very misleading, in my opinion. I was expecting a book about the idea of photography, instead I got a collection of essays mostly about some famous photographers. Eh. Didn't learn anything new. Incisive writing from a philosophic and technical point of view from someone within the photography community itself. Wonderful short collection of essays on photography and the approach of photographers to their art. Admittedly this book is marketed toward a self selecting group. Still I think it is important to reflect on the merits of reading or not reading this book. As others have pointed out, the title is misleading. There are hints of interesting insights hidden throughout the book but more often Adams' essays read like a short book report. Unfortunately the insights are hidden and it takes a lot of weeding through pages of quotes from other books and commentary on why he thinks they got it wrong to find the insights. With respect but not much enthusiasm, I would say that the light in this book comes mostly throughwell-deployed quotations from the work of other and better writers. I appreciate learning about somegood photographers I had not heard of before. But the book is uneven, with what reads as freshly thought sections being followed by sort of padding consisting of old book reviews and essays written for other purposes. An unusual mixture of essay, biographies, and social commentary all settled around photography. Several worthy gems have been highlighted and recorded for future inspirations. The second book I've read recently that I have to stomach a paragraph of venom spewed at hunters, as with the other, if you can ignore there is much to be taken from the rest. I do wish nature lovers of all types could co-exist better. Largely, "Why Photographers Photograph" rather than the title. But it does touch on the veracity of photography (oh, for those innocent days) and its ability to record the (past) state of nature. In this its tone can resemble a lament. This also leaks into his eloquent interpretations of the classic American photographers. A book that asks big questions and describes a lot of the problems with being "a photographer" or having a "a photographer's life" though those titles can play out in a myriad of ways. The later parts of the book it drops off a bit. Focusing more on the works of other photographers and for my interests was too dated to matter. An amazing small book of essays on photography, art, the environment and America. Yes, America, with an 'A.' All from the perspective of a photographer of course, but it's so much more than just another book on photography. Worth reading and rereading, especially when one has the time and space to think more seriously and quietly about the ideas and discussions it contains. A collection of essays by the great photographer Robert Adams - filled with great, life-affirming aphorisms on subjects like creativity, inspiration, the delicate skill of cultivating creativity without losing it, the lamentable loss of the pristine landscape of the West, the need for environmental conservation and the (still) current seemingly deteriorating state of America. Reads like an intellectual biography. Interesting insight into the mind of a professional photographer, but for me less valuable on more abstract ideas about why we photograph, which I think others like Barthes and Sontag do much better. The first third of this book had me captivated, but the rest was a chore to get through. Some of the essays about particular photographers were nice, but I kept having to jump out of the book to search online for a visual reference. I somehow was sidetracked and haven't finished this yet, but I was inspired by everything I have read so far. This book was extremely helpful in aiding me in writing my artist statement for my bfa project, and also gave me more of a drive for my work. Good read, a must for those serious about taking photography seriously. absolutely brilliant, inspiring articles. i'd recommend to everyone. Great book, some major insights into Photography and many other topics. Great history too and perhaps the most valuable to me was the section on Teaching. Great advice, observations. Such a force. RobertAdams - Librarian Note: There is more than one author in the GoodReads database with this name.See this thread for more information.Adams, Robert Hickman (1937-) American nature photographerAfter earning a doctorate in English and becoming a college professor, Adams decided to shift careers and focus on his true love, photography, in 1970. Since then, he's made a name for himself with more than 20 books, mainly chronicling the, American West, particularly the Colorado landscape, in and around Denver. He attributes his affinity for the Western landscape to boyhood adventures such as hiking, river rafting, and camping. His black and white photographs of characteristically spare landscapes have brought him two National Endowment for the Arts Photography fellowships (1973, 1978), a Guggenheim award (1973), and a MacArthur fellowship (1994).